In an earlier post we we recalled the effects of the 1890s drought in Nebraska. Unfortunately, it would not be the last. One of the joys of the extensive NSHS photo collection is the inevitability of stumbling upon interesting photos that have nothing to do with what you’re actually looking for. The designer of this 1930 advertising stationery didn’t know it yet, but the expression “Thriving Thirties” was not going to catch on. Printed by the Epsten Lithographing Co.
It’s Too Hot to Sleep Inside! The lawn of the Nebraska State Capitol provided a resting place for Lincoln residents trying to escape the heat in July 1936. NSHS RG2183-725 (above). 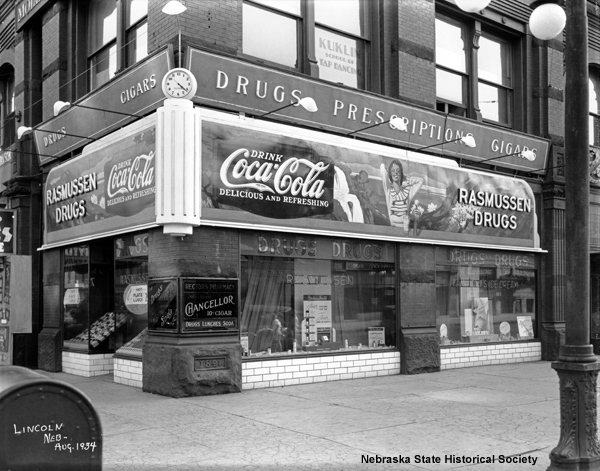 During the Great Depression Nebraskans became accustomed to living under trying conditions. People had to cope not only with hard economic times but with the intense heat accompanied by a drought that plagued this state and much of the rest of the country. Read more about It’s Too Hot to Sleep Inside! Rev. Russel Taylor and the Struggle for Civil Rights in 1920s Omaha. Read more about Rev. Russel Taylor and the Struggle for Civil Rights in 1920s Omaha.